a dark well, when she could stomach it no longer. As its description states, the Rakuyo demands great dexterity. To wield this trick sword, you will need to have 10 strength and 20 skill. This weapon receives no scaling bonuses from strength - its a skill weapon, and it scales highly with this stat. Increasing its damage is very straightforward since you'll only need to invest in one stat, and this will free you to pursue other attributes. Attacks are on par with the speed of the Chikage and use a similar amount of stamina; if the Chikage is a bit too risky for your tastes, this is a great alternative. The Rakuyo uses a mixture of normal physical and thrust attacks across both modes. If you look at the tables, you'll notice there are less thrust attacks overall, but they're usually good enough to warrant their use. Normal Mode: There's less variety to the moveset for this mode, but you'll be able to use left hand weapons, which isn't something you can do while the Rakuyo is transformed. You can also stagger foes from behind with this mode. 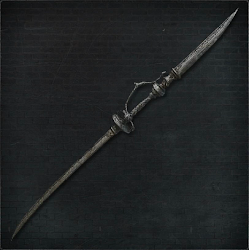 You're most likely going to have high investments in skill if you're using this weapon to begin with, so rear visceral attacks are going to deal more damage too. Transformed Mode: Stamina cost and damage is quite comparable between both modes. The main difference for this mode is in its speed; transforming the Rakuyo will snap the knife off of the hilt end of the weapon, which will then be used alongside sword swings, or for quickly alternating between hits. Normal: From the first lamp in the Fishing Hamlet, follow the path until you reach the well in the middle of the lake-ish area (there's a caster who throws shadow skulls at you). You can drop down the center of this well, and there will be the large enemy down there. Kill it, and the other one will drop from the roof. Once you kill the second one, Rakuyo will drop. You can make the Rakuyo a purely elemental weapon with the use of gems, but its arcane scaling is low, so it's not the most effective use of slots. Considering that the majority the Rakuyo's attacks are normal physical type, Tempering effects will do well to increase its damage. If you want more use out of its thrusting attacks, you can slot Adept (thrust) effect gems. A lot of really good attacks will use a lot of stamina; two noteworthy examples are the transformed R2 and L2 chains. Radiant gems will do well to combat their heavy stamina consumption, so consider these if you’re willing to use slots for something other than damage. Some thrusting attacks have good forward momentum in addition to range; these attacks (among others) will land you a lot of easy counter hits, so Finestrike might be a good use of a gem slot. For more information check the Best Blood Gem Setups page. Normal Mode: The R1 chain is a rapid alternation between normal physical and thrust type snacks. It may not be as fast as the transform mode R1 chain, but it can be somewhat useful for handling enemies weak to thrust attacks. Once the chain has finished, it will repeat, starting from the fourth attack onward. The fourth hit deals better thrust damage than the second, so this is an optimal looping point for dealing this type of damage. Rolling and quickstep attacks are good for single strikes, and they don't cost much stamina for their type. They have good forward momentum, but the way the blade is swung offers you low range, so you may miss more evasive targets using these. The backstep R1 is much better in this regard, and it swings horizontally, slowing you to hit multiple enemies with ease. The backstep R2 costs a reasonable amount of stamina for its damage, and has good forward range since it's a thrust attack. If you're using this move for dodging attacks, you can get easily additional damage with counter hits. The fully charged R2 is a high damage thrust with good forward momentum. These things together make for an attack with amazing reach, so it's well worth the price you'll pay in stamina to use it. It's best to begin the charge a bit before your target is within reach, so that you hit them before they can begin an attack. It can also be used to stagger enemies from behind. If an enemy is unaware of your presence, you can use this attack to stagger them without getting too close, alerting them of your presence. Transformed Mode: The R1 chain handles crowds quite well, despite not having the reach you'd usually expect of attacks used in this way. This chain only deals normal physical damage and performs much faster after the first hit. If your opponent isn't weak to thrust damage, you can dish out damage more quickly with this than you would using the normal mode's R1 chain. If you press L2 at any point during the chain, you'll use a unique combination attack. It uses a lot of stamina to perform, but it will deal good damage while removing more enemy super armor than any other single hit. The backstep, rolling and quickstep R1s provide the same amount of stamina for damage as the normal mode, but will allow you to perform another action much earlier. These can be handy for single strikes, and they flow into the R1 chain quite well as a bonus. This mode doesn't have a charging attack, but it makes up for this by giving you an R2 chain instead. Both attacks of this chain score lower than the weapon's overall attack rating, but they're perfect for consistently dealing thrust damage. Like with the R1 chain, you can press L2 for a special combo attack; in this case, you'll perform another thrust, but with higher damage. The dashing and backstep R2s are strong thrusting attacks as well. The dashing R2 deals out the better damage of the two, but you'll need proper spacing to use it. The backstep R2 may deal less damage, but benefits from its own distance control, since backstepping is a prerequisite. Used on its own, the L2 leads into a chain as well. Each time you press L2, your character will spin, slashing twice horizontally. These attacks are immensely useful for crowds, since they hit ail the way around you multiple times. Performing both parts of this chain will use a whole lot of stamina, but provide a great deal of damage in return. Moveset Data: 3rd L2 can only be performed after an R1. 4th L2 can only be performed after an R2. Durability of the weapon depletes when used. This means hitting an enemy, destructible object or bouncing off the walls. Hitting undestructible objects and environment does not deplete your durability. Style of an attack or upgrade of the weapon, even different weapon, does not matter - each count as one hit. Every 10th hit against the enemy/object depletes 1 durability. Exception is Tonitrus, which when in self buffed mode, depletes durability at rate of 2 hits. Hitting an enemy in dying animation still counts as hit. Also hitting multiple enemies/destructible objects at once counts as one hit per enemy - hitting 3 enemies at once counts as 3 hits towards durability counter. Shields lose 1 durability every 10th hit. Bounce means when your hit is bounced back off the wall or other objects. Every 5th bounce depletes 1 durability. Not every weapon can be bounced off, Rakuyo belongs into the category which cannot. Damage reduction when heavily worn. When weapon is at 30% of total durability, it reaches the Risk state and AR is reduced by 30% and when it hits 0% of total durability, weapon is Broken, then AR is reduced by 50%. Rakuyo which has 200 points of durability reaches risk state at 60 Dur. Workshop's Repair: cost of repair depends on the weapon and its upgrade. 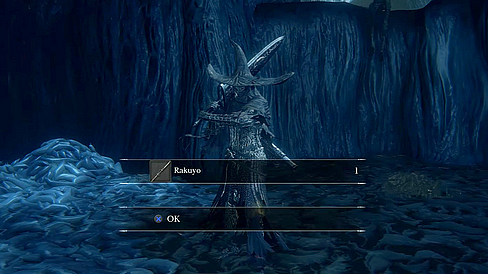 For Rakuyo +0 it's 2 Blood Echoes per 1 point and for Rakuyo +10 it's 8 (values are rounded), full repair costs for +10 are 1600 Blood Echoes.